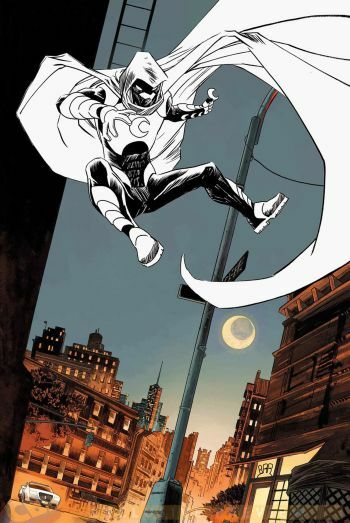 NEW YORK (CNS) — One of the best comics to have been published in the last few years was a 2011 reboot of “Moon Knight” by writer Brian Michael Bendis and artist Alex Maleev. The series, published by Marvel Comics, explored the life of Marc Spector, aka the nocturnal, white-clad superhero Moon Knight, a character first created in the 1970s by Doug Moench and Don Perlin. Spector was a mercenary and former CIA spook who gained his special powers from Khonshu, an Egyptian moon god. As re-imagined by Bendis and Maleev, Spector also suffered from mental illness — specifically dissociative identity disorder, or DID, formerly known as multiple personality disorder. Spector’s different personalities would manifest as superheroes; he would hear, and be aided by, visions of Spider-Man, Captain America and Wolverine. His situation became especially poignant when the real superheroes showed up after realizing that Moon Knight’s hunch about a crime was well-founded. The Bendis “Moon Knight” didn’t sell very well and was canceled after 12 issues, although it is still available in paperback and digital forms and is well worth reading. But now Spector has reappeared, this time in a version of his adventures written by Warren Ellis and illustrated by Declan Shalvey. There has been a dropoff in quality from the Bendis and Maleev “Moon Knight,” both in writing and art. In particular, Shalvey’s work lacks Maleev’s poetic realism. Ellis also has altered important aspects of Moon Knight’s profile. Spector, for instance, now lives in New York City instead of Los Angeles. This change of venue, however, only weakens the story. Bendis’ Moon Knight was a TV producer in Hollywood whose psychological affliction was cleverly portrayed as an aid rather than a hindrance to getting ahead in the entertainment business. It was also refreshing to have at least one superhero living far from Gotham — a metropolis already chockablock with caped crusaders. In a far more significant shift, Spector is no longer mentally ill. Instead, he’s the victim of brain damage. Spector discovers this when he goes to a psychiatrist who informs him that what he had thought of as dissociative identity disorder is actually his brain reacting to being possessed by “an outer-terrestrial entity,” i.e., Khonshu. In short, the deity that gives Spector his power is also harming his mind. Khonshu has four different aspects: Pathfinder, Embracer, Defender and Watcher of Overnight Travelers. As he moves among these aspects within Spector’s body, Spector’s mind can’t handle the changes. It’s like Spider-Man being poisoned by the same radioactive insect that made him amazing. Moon Knight’s new diagnosis alters the dynamic of the story. Instead of being a benevolent force, Khonshu is a toxic parasite damaging Spector from within. Spector, accordingly, is no longer an empathetic figure who handles his ailment by drawing strength from his heroes — like a flawed human being appealing to angels or saints for guidance. Rather, he’s simply the helpless host of an overpowering interloper. Another casualty of Ellis’ take is the implicit pro-life message previously embedded in Bendis’ narrative. Here, after all, was a character with a disability who not only coped with his limitations — and turned them to career-advancing advantage — but actually managed to transform them into an asset in his work as a superhero. By removing Spector’s relatable problem, and replacing it with a supernatural form of possession, Ellis deprives his text of its potential resonance both for handicapped readers and for those committed to the underlying equality of all human beings. While there is no sexual content in the latest “Moon Knight,” its frequent depictions of graphic violence are not suitable for children. The Catholic News Service classification is A-II — adults and adolescents. The Marvel Ratings System rating is T + Teens and Up — appropriate for teens 13 and above. Judge reviews comics and video games for Catholic News Service. his is the most off the ball Moon Knight article I’ve ever read. Bendis’s run was poor. It’s poorness is well noted. It has nowhere near the polish of Ellis’s recent take. The DID shtick was stupid. It made no sense at all. Ellis even quite pointedly and astutely made mention if this in #1 of his series. You say that redoing the D.I.D. thing into ‘god living in my head that manifests as some form of brain damage’ weakens potential resonance for handicapped readers? Why? Because he hasn’t got D.I.D anymore? Newsflash, genius. He has brain damage. He still has a ‘handicap’ to both overcome and use to his advantage like before. Also the way D.I.D was explained and portrayed in Bendix’s run was so wrong. It borderlined on offensive. People do not develop D.I.D from playing to many characters. Oh and one more FYI. The bulk of Moon Knight’s comics are set in New York City, L.A was the only MK series (aside from West Coast Avengers) to be set there. Finally, as a long time Moon Knight fan who has actually read all of his books. Taking a cheap, highhanded and really quite poorly researched stab at Warren Ellis’s new series is not on at all. As you for one are pretty ignorant on all things ‘Moon Knight’. You haven’t the faintest about what you’re talking about.